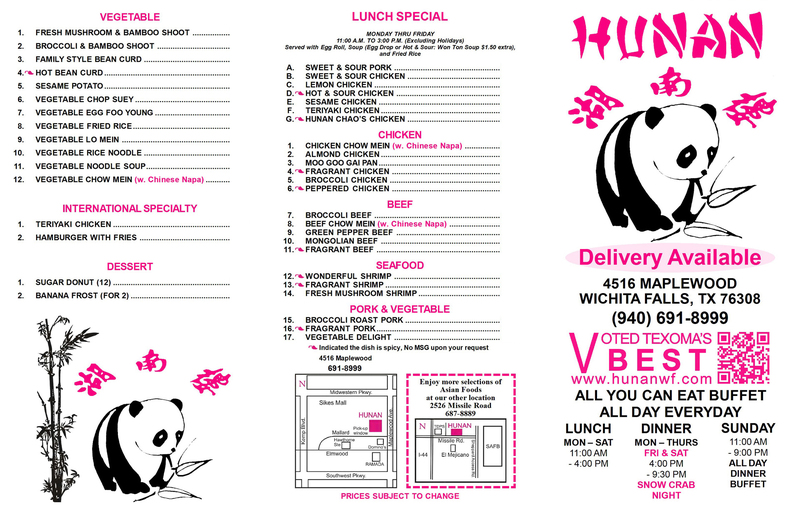 Hunan Chinese Restaurant offers authentic Chinese and Asian cuisine in Wichita Falls, TX and the surrounding areas. 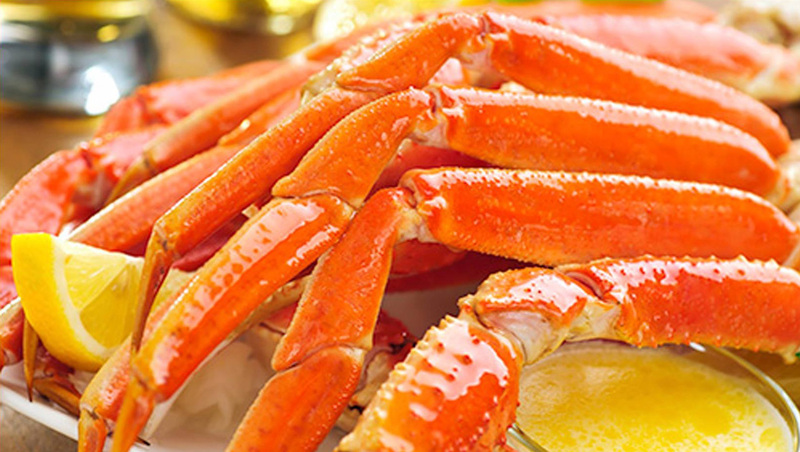 Our buffet is open 7 days a week for your convenience, and we serve all varieties of Chinese and Asian dishes, from Szechuan beef and Kung Pao chicken to spicy Korean, Pad Thai and Singapore noodles. Come see exactly why we’ve been a favorite of Wichita Falls since 1982. We also deliver to most of Wichita Falls. All you can eat buffet, all day everyday. Take-out and delivery available. 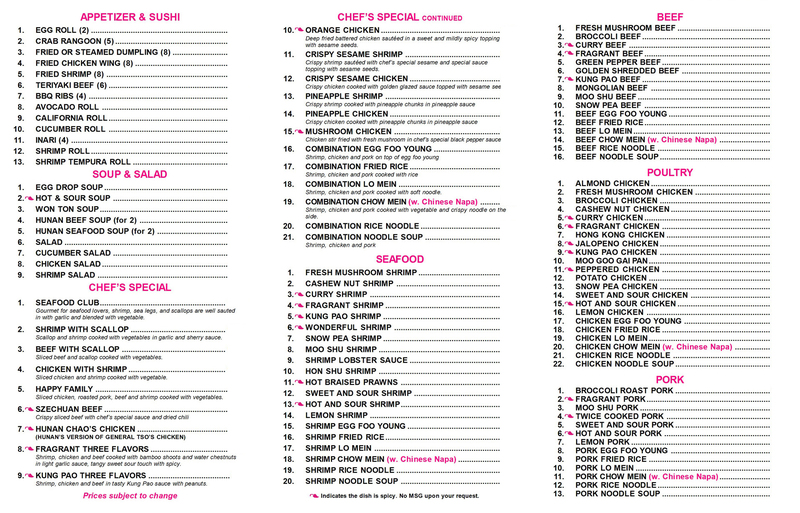 Order take-out or delivery. Call us 940-691-8999. Wonderful Shrimp with fried rice. 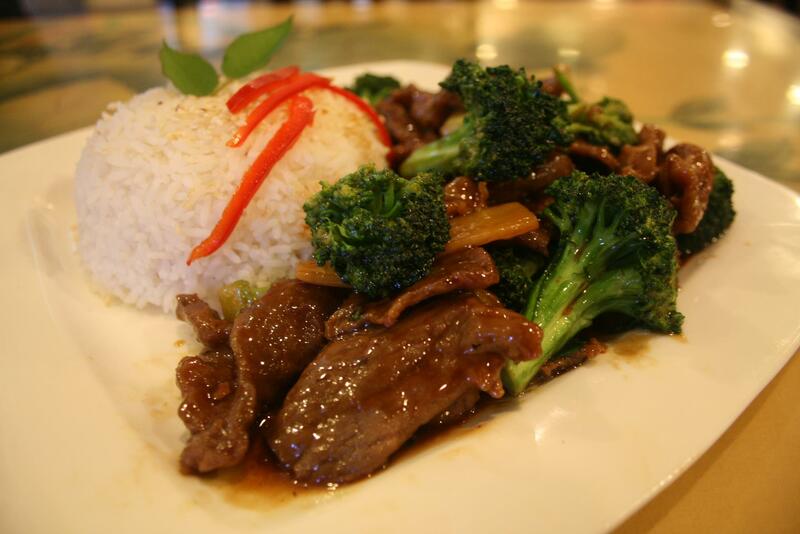 Broccoli Beef with steamed rice. Large and spacious dining area. The origin of the Hunan Chinese restaurant dates back to a young Midwestern State University student from Taiwan. The student, George Chao, found time to work for an older man who ran a Chinese restaurant in Sikes Senter. "The owner really liked my brother," said Ann Wang, the assistant manager of Hunan. "When the owner was about to retire, he asked my brother if he was interested in running the restaurant. My brother called one of my other brothers who was working as a cook and said there was a chance we could have an Asian food restaurant here." The remaining members of the Chao family, including mother and father, three other brothers and three sisters, eventually relocated to the area from China to start what has become a successful family business. 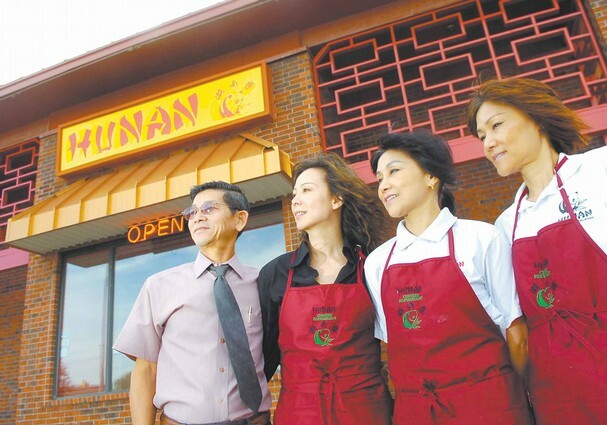 Twenty-five years later, that family enterprise - which began in Wichita Falls with Hunan - now includes three additional regional family restaurants, including the nearby Hunan Asia. Wang, whose name before coming to America was Chao-ling, has worked at Hunan for 25 years. When her brothers and brothers-in-law took over the restaurant in the mall, they asked her to come from China to help out. Wang's husband, Chi-Te Wang, soon joined her in America as a business partner after retiring as a pilot from the Chinese air force. A people person, Wang started out at Hunan hosting. Over the years, she has learned pretty much everything about the business. "My responsibilities are I kind of do just about everything. My position right now is to oversee the quality of the food." She is lucky, she said, to work where everyone wants to do the job right and they readily fill in to do whatever is needed. Like her siblings, Wang spends almost all her time at the restaurant. That full-time and overtime approach to the family business is mostly a cultural thing, she explained. "We just want to do whatever we do right. When we don't work here, we still talk about cooking and we want to learn new recipes at home." The difference growing up in China compared to here is huge, she said. "Where we grew up, of course, we already knew we had to work hard. In most Asian countries, they are not very wealthy compared to America. That's why everyone wants to move to America." 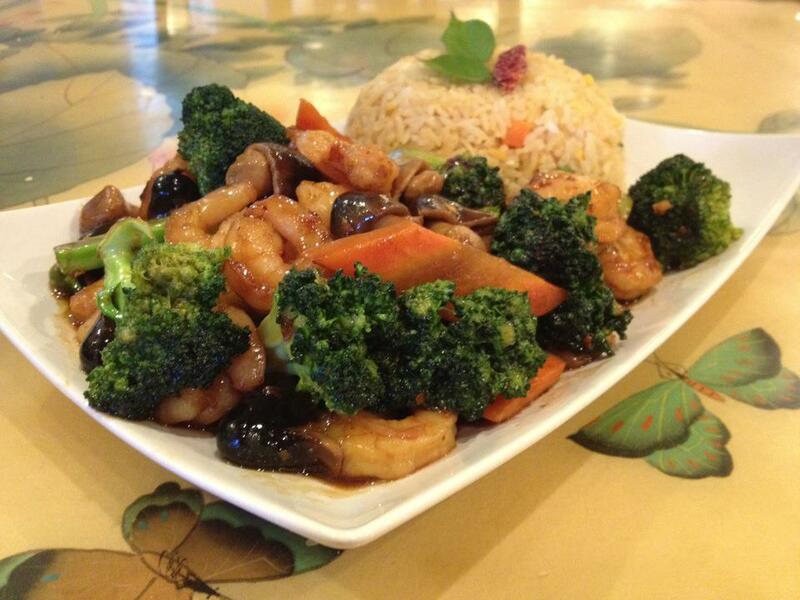 Hunan has grown considerably since the restaurant was located in the mall. Wang said the success of the family business revolves around work ethic, the quality of the food and their innovative recipes. She and her family members are never really satisfied with what they accomplish. "We always want to do things better and better. All the time, we always want to learn more and more and more." 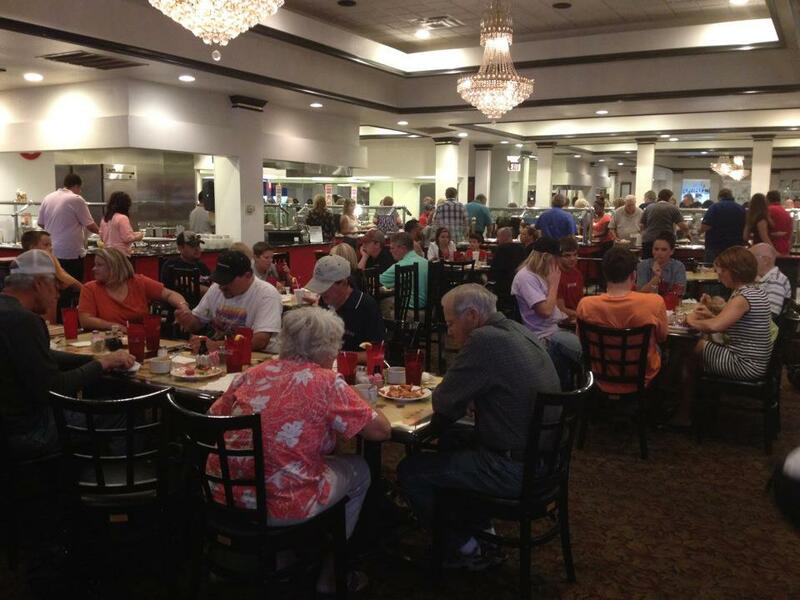 They carefully consider and reconsider the entrees featured in their buffet and on their menu. Often times, they will try out new recipes and entrees and ask their customers what they think. The recipes at Hunan, she said, have developed over their many years in the business. "Everyone knows in China that you have really well known foods like General Tso's Chicken and chicken lettuce wrap and all those famous foods, and they already have their recipes." "But, you can always add flavors. We have our version of the General Tso's Chicken (Hunan Chao's Chicken) and we have our own spicy chicken." Wang was born and raised in Taiwan. Her father died two years ago. Her mother still helps out at the restaurant. "She never gives up," Wang said, "always helping out a lot." Wang has four brothers and two sisters. Steve Chao is the main chef at Hunan. George Chao now runs a restaurant in Ponca City, Okla., and Long Chao oversees a restaurant in Dallas. Both sisters are involved in the business. One works at Hunan and is married to a partner. Her other sister works at another job but still helps out when needed. Wang's husband runs Hunan Asian with a young cook named Tsu-Ted Chao - the son of Hunan head chef Steve Chao - and a third-generation member of the business. She and her husband have two children; one lives in Amarillo and the other in Germany. Although Wang majored in accounting in China, she never really wanted to employ her education in the real world. "I hate math," she said with a laugh. "I don't like numbers. I like to work with people. I get to work here with all kinds of people and I just love it." Even if she had the opportunity to start all over again, she would still choose to work with people whether it is children, teens or older men and women, she said. Having lived in Wichita Falls for 25 years, she's learned a lot about the area culture, and that the people are very nice. "Everyone here is very, very sweet," Wang said. "But a lot of things are new." One of the things that still surprises her is the relationship of some people to their elders. In Chinese culture, she explained, it is very different. "It doesn't matter whether you are right or wrong. If they tell you to do something, even if you don't like it, you have to say, 'OK.' Even like me, if my older brother tells me something, I still say, 'OK, OK I will do it.' "
Wang still visits China from time to time, for work as well as to visit her husband's relatives. Each year, several employees of the restaurant make time to visit China to continue their education in food preparation and to discover new recipes. "Cooking to me is art," and is a significant means to a personal and professional goal, Wang said. "Cooking is something you can do, and if it's good and people enjoy it, then that achieves your goal - to make you happy." The appreciation of good cooking has changed over the years with diners becoming more conscious of eating healthy foods, she said. In the past, many of their customers loaded up on the buffet, just because the entrees tasted good. But people are also now a little more conscious of what they eat. "You always want to serve people good and healthy food," she said. "We have been here 25 years, and most of the customers are our good friends." © 2017 Hunan Chinese Restaurant. All rights reserved.